Did you forget Valentine’s Day was coming? There’s still time to impress your date with a rock concert, an art show, or a Japanese flea market! New father Lynn Lynn steps back on stage to perform his one-man show for rock fanatics at Kandawgyi Lake’s Hmaw Sin island. 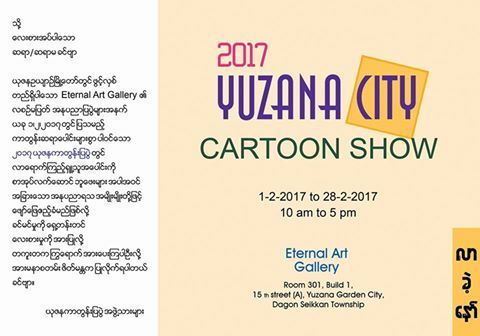 Tickets are available at 09-451010789, 09-782097436, 09-965010789, and in City Mart branches around Yangon. Feb. 12, 7pm. Kandawgyi Hmaw Sin Kyun. Tickets 7,000 kyats. Seven different bands will perform in this Valentines Day concert. Acts include Sai Sai Kham Leng, Snare, Hlwan Paing, Bunny Phyo, Yair Yint Aung, Bobby Soxer, and Amera Hpone. Tickets are available at 09-425557666, 0-18619029, and in City Mart and Orange branches throughout Yangon. Couples get a discount when purchasing tickets together! Feb. 14, 6pm. Kandawgyi Hmaw Sin Kyun. Tickets 9,000 kyats per person or 15,000 kyats per couple. Burma’s motion picture industry will celebrate its centennial in 2020. (That’s 100 years!) In anticipation of the big anniversary, musicians will gather to perform famous songs from Burmese film. 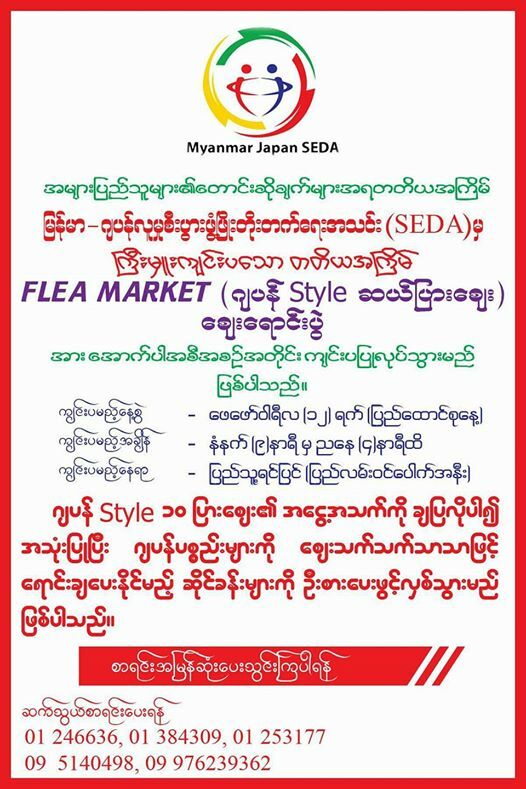 Tickets are available at City Mart branches around Yangon and in Nobody fashion shops. Feb. 11, 7pm. National Theater, Myoma Kyaung St. Tickets 10,000-70,000 kyats. The third edition of the Japan-style flea market will feature a wide variety of used Japanese products on sale. Items on sale will include high-tech electronics, clothing, cosmetics, and consumer goods. Feb. 12, 9am-4pm. People’s Square (Prome Street Entrance). Admission free. 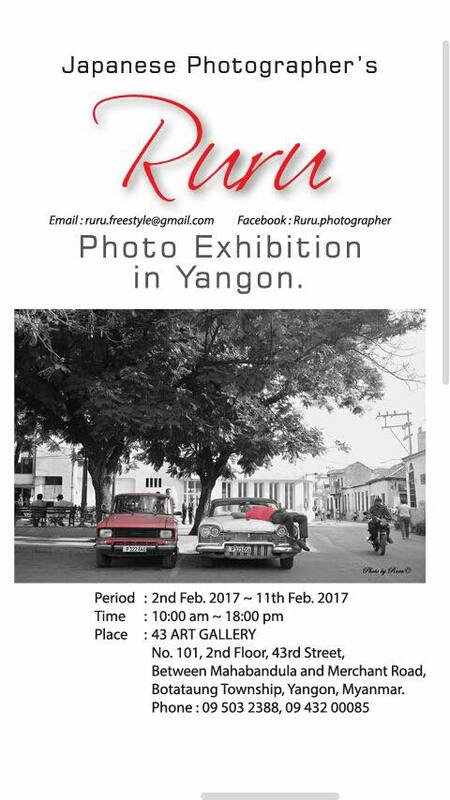 This new exhibition by the Japanese photographer Ruru will showcase 48 photos that the artist captured in locations around the world, including in Burma. Photos will be available for purchase for 50,000 kyats each. Feb. 2-11. 43 Art Gallery, No. 101, second floor, 43rd Street. More than 100 shops will celebrate Burma’s Children’s Day as they sell clothing, toys, and supplements for kids. Kids will be able to participate in games, dancing, drawing, and singing contests. 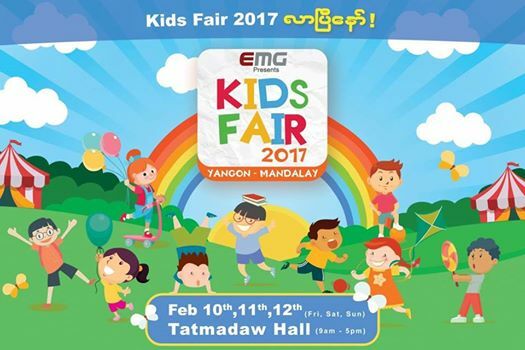 Feb. 10-12, 9:00 am-5:00 pm, Tatmadaw Hall, U Wisara Road. Free admission. 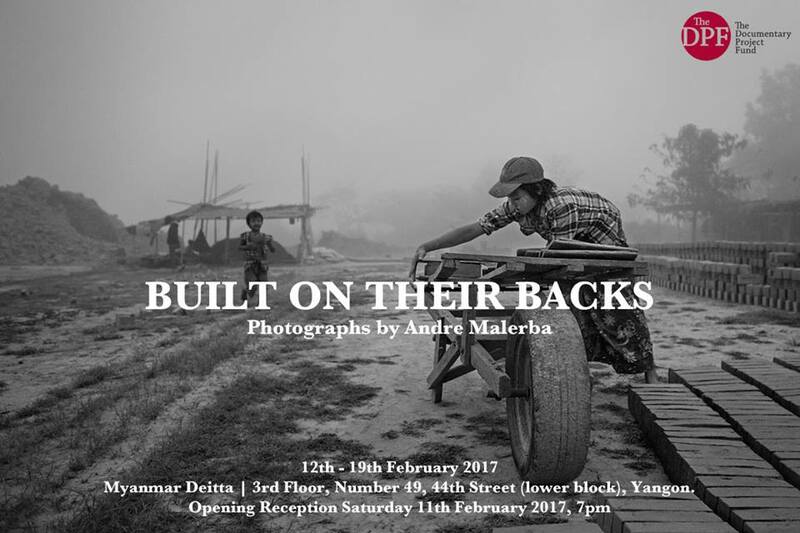 Photographer Andre Malerba has captured the home and workplace of Naing Lin, his wife Than Nwe, and the birthplace of their four children—in a brick factory on the outskirts of Rangoon. The photos reveal their world, their anger and joy, the dust, and the rain. Together, the family ekes out a living. The bricks which provide their income—and which trap them in debt—contribute to an economy that excludes them. They struggle with less-than-livable wages, medical bills, and not enough money to send the children to school. Feb. 12-19. Myanmar Dietta, No. 49, 44th Street. The Eternal Art Gallery hosts an exhibition of cartoon strips from 19 artists—both published and unpublished in the media—for the entire month of February. Feb.: whole month. Eternal Art Gallery, Yuzana Garden Housing. 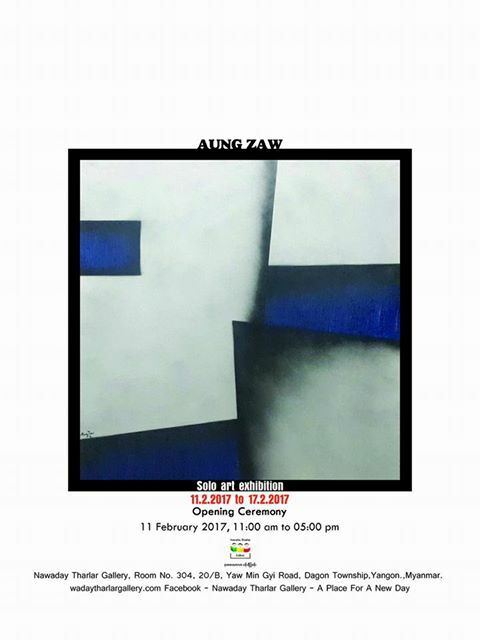 Painter Aung Zaw will display 15 acrylic works at Nawaday Tharlar Art Gallery in this solo exhibition. Tel: 09-43097918. Feb. 11-17. Nawaday Tharlar Art Gallery, Room No. 304, 20/B, Yawmingyi Road, Dagon Tsp. 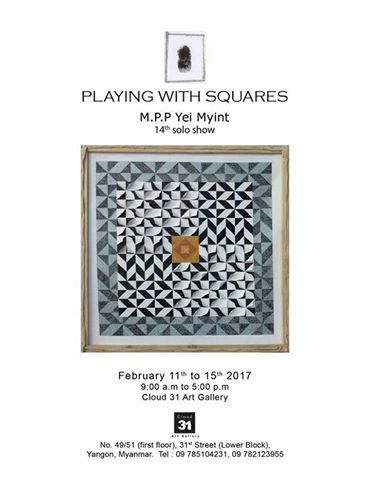 MPP Ye Myint, one of the most recognized contemporary artists in Burma, will showcase some 20 acrylic works at his 14th solo art exhibition. Feb. 11-15, Cloud 31 Art Gallery, No.49/51, 31st St., between Merchant and Maha Bandula St.